In a haul post I did a few weeks ago I mentioned a couple of products I picked up from Formula 10.0.6. I'm new to this brand and only picked up a few products but overall I like the brand! I have pretty sensitive skin and found that their products are pretty strong when it comes to cleansing so they may be a bit more tailored to oily and/or acne prone skin. So let's start with my favorite product of the three, the Best Face Foward Daily Foaming Cleanser--I really love this cleanser, it kept my skin clear yet didn't dry it out or irritate it in anyway. Best of all is it's scent, it has the most amazing fruity scent to it that makes me look forward to using this cleanser every day! Next up are the Keep Me Clean Clarifying Facial Wipes--These are some of the strongest face wipes I've ever used, they removed makeup but not mascara very well (but most wipes don't) and I found them to be a little too strong to use around my eyes. They really get your skin clean but for me I think I'll stick to my sensitive skin wipes. Finally is the Deep Down Detox Ultra-Cleansing Mud Mask--I was so excited to try this but never really got the chance seeing as the moment I put it on it started to burn my skin, nothing too intense but enough for me to have to wash it off within 30 seconds. However, my mom tried it and her skin is not as sensitive as mine and she found that she really liked it. Now I don't think this is a bad face mask because usually if something burns my skin it's almost always because it has strong acne fighting agents in it so if you have oily and/or acne prone skin this would probably work for you. If you have sensitive skin, I'd skip this one. Overall I do like the brand--it has adorable packaging, a good price range (mostly under $10! ), and the products are good. Even though my experience wasn't the best with these products I know it's because this brand is really more of a stronger acne fighting brand and I need a little more gentle of products. I did love the cleanser though and will definitely be re purchasing it! I know this wasn't the most positive review but the biggest thing to keep in mind is that I have pretty sensitive skin and, in terms of ingredients and intensity, these are stronger products. 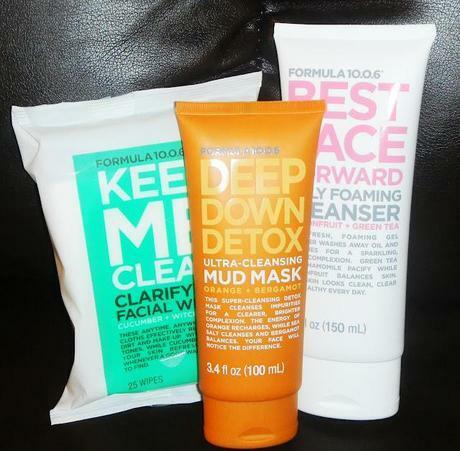 So if your skin isn't sensitive and you are looking for good quality acne fighting products that won't break the bank then I really think you will like Formula 10.0.6 because this brand does seem to be more for acne prone skin.